This doc will walk you through deploying an Ubuntu 14.04 server on Digital Ocean through Mist.io and provision an Ansible playbook that will install a Node.js/nginx/mongodb stack. The Ansible playbook will take care of any requirements and will act as a base to build upon and tune configuration to fulfill your needs. 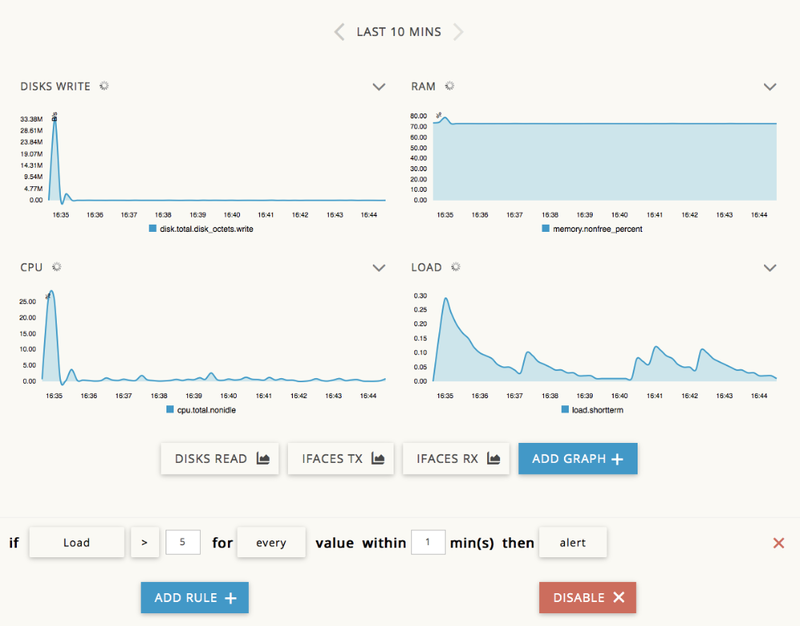 After the newly created virtual machine is provisioned, Mist.io will enable monitoring and set up some rules to alert you in case of high system load. You will need to add an SSH to Mist.io if you haven't already done so. The key will be deployed on the newly created machine so that Mist.io can access it. From the main page enter the Keys section, press Add and insert the name of the key. 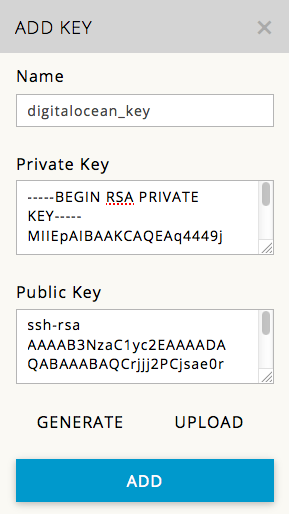 Press generate to have an SSH RSA key produced by Mist.io, or upload an existing private SSH key file. This Ansible playbook will install nginx and set some default configuration plus a 'Hello world' page. It will also install Node.js 0.12 through https://deb.nodesource.com and mongodb through mongodb.org. It is a simple playbook designed to be used for testing and act as a base for preparing more advanced ones to suit your needs. The way the playbook is organized (with roles, tasks, templates, defaults and handlers) makes it easy to extend and add additional parts, like more template files for the Node.js, or set some github repository to clone, set nginx's configuration to proxypass the Node.js app etc. From the main page, enter the Scripts section, press Add script, specify a name, then select Ansible Playbook as Type, Github as Source, specify https://github.com/mgogoulos/ansible-provisioner as the Github Repo and playbook.yml as the Entry point. The entry point is the playbook that will be run. We can see the output of the playbook by visiting the playbook we've run on the Scripts section. The stdout part can prove valuable in case something went wrong. The Ansible playbook remains stored in Mist.io so running it on an existing server is a matter of selecting it and opening the Run script dialog. As soon as it gets finished you will be able to see the output.